With summer, the most exciting time of year for kids, just around the corner Family Channel  is readying its plans to make this the best summer ever! Family’s annual Big Ticket Summer Concert, presented by LEGO Friends, will be touching down in seven locations across Canada this August. The highly-awaited concert tour will visit more than double the number of cities of last year’s show, traveling coast-to-coast from August 15-25 making stops in Abbotsford, Calgary, Edmonton, Saskatoon, Winnipeg, Toronto and St. John’s. Showcasing the biggest and brightest young talent from across the globe, Brit pop-rock band The Vamps  and rising superstar Becky G  are among the performers taking the stage this year. For a complete list of tour dates, venues and ticketing information, please visit Big Ticket Summer Concert’s online destination, Family.ca . 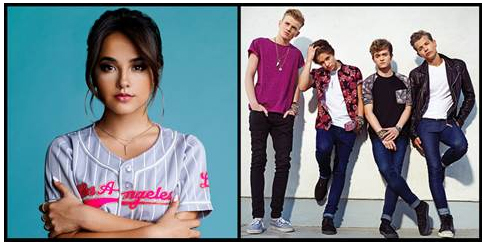 Becky G and The Vamps to perform on Family Channel’s Big Ticket Summer Concert tour. This year’s Big Ticket Summer Concert bill will also showcase the talent of Canadian alternative-pop artist Shane Harte  whose debut single “Let You Know” is racking up views and streams from around the world. And from California, The Tide  will open the shows. Of course, the event wouldn’t be complete without appearances by some of Family’s biggest stars and, after performing across the country on a sold-out national tour, cast members of the wildly popular tween drama The Next Step  will bring their high-energy dance routines back to the live stage for what will be their fourth Big Ticket Summer appearance. Series stars Jordan Clark  (Giselle) and Lamar Johnson  (West) show off a few of their other talents, bringing an added dose of charisma and charm as this year’s concert hosts. Fans who can’t wait to get their hands on tickets to the biggest concert event of the summer can tune in to Family tonight at 6:30 p.m. ET/PT for a special message about the concert, including information on how to obtain a limited-time pre-sale code. Advance tickets will be available for all seven shows beginning tonight, through Thursday, June 4 at 10 p.m. (local time). The pre-sale code will expire when the limited quantity is sold out, or on Thursday, June 4 at 10 p.m. (local time), whichever comes first. Ticket sales open to the general public on Friday, June 5 at 10 a.m. (local time). For additional event information and to purchase tickets, please visit Family Channel  or Ticketmaster . A one-stop online shop for everything Big Ticket Summer Concert-related, Family.ca  answers all the questions fans have about the show. The dedicated website features details about the hosts and artists, offers music videos from the concert’s performers and allows fans to pre-order concert t-shirts at the online merchandise store . Plus, later this month, fans can enter the “LEGO Friends VIP Experience Contest,” for the chance to win an once-in-a-lifetime trip for four to the Toronto show. Offering a daily vacation from everyday life, Family’s Big Ticket Summer campaign features a robust programming lineup that will make a splash this summer. The upcoming schedule includes sneak previews of the network’s newest series, not-to-be-missed specials featuring guest appearances from this year’s concert performers and exciting episode marathons of Family’s hit shows. Family is also home to two brand new Disney Channel Original Movies: Teen Beach 2  (June 26), the music and dance-driven sequel to Teen Beach Movie featuring Ross Lynch and Maia Mitchell; and the eagerly-awaited Descendants  (July 31), a live-action modern day fairy tale starring Dove Cameron and Kristin Chenoweth. Additional details surrounding Family’s summer programming will be released in the coming weeks. 2 Comments To "Family Channel Sets Dates For Big Ticket Summer Concert Series Presented By LEGO Friends"